A flexible sleeve also with internal and external teeth. Standard material for the flexible sleeves is PROCOUPLAN. Unless otherwise specified, the flexible sleeve is supplied as standard in a 1-piece design (JX). An open version is also available on demand (type JXC). Its high torsional elasticity provides the installation with a low natural frequency. Together with its capacity to dampen vibration, SURE-flex® is a very appropriate selection for applications with reciprocating equipment such as when engine driven. The open version allows the replacement of the sleeve without moving the connected equipment. This is done by moving just the flanged hubs provided they are mounted on the shafts with a slip fit. HYTREL® (H) material can also be supplied upon request. 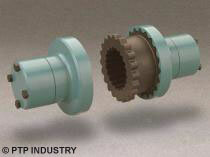 This type of sleeve has a torque carrying capacity which is 4 times higher but with a reduced torsional flexibility. Sizes 5 to 16, cast iron flanged hubs, pilot bored or finish bored upon request. Sizes 3 to 5 are equipped with light alloy (Zamak) flanged hubs and provided with standard bores. The SB range incorporated tapered Magic-Lock® bushes (available from stock with finish bore) fitted with setscrews. Available for sizes 6 to 11: with its add-on hubs, this type is particularly suitable for pump applications. This configuration allows to disconnect the equipment without disturbing shaft alignment. Sizes 6 to 16: a flywheel adapter plate is used in the place of one hub. (1) Standard material for the sleeves of sizes 12 and 16 is EPDM and of a two piece, axial split design (SE).